Sword ferns Polystichum munitum are a native plant here in the Pacific NW. They are extremely hardy with an expansive root system making them indespensible in soil stabilization projects. A usually evergreen fern that integrate nicely into modern and rustic landscape designs. Over time the older fronds turn brown and new fronds emerge seasonally in Spring to rejuvenate the plant. Those old brown fronds eventually lay down in a ring around the base of the plant. Over time, the fern can start looking a bit raggedy with all the old brown fronds. Also the foliage may suffer from winter freezes. In manicured landscapes, it may be desirable to occasionally prune out the old fronds. One can renovate sword ferns in “one fell swoop” by cropping back all the old foliage at once…tight cropped quite low to the ground (with hand pruners or shears). My fern vote is to wait and see how they are looking in February. 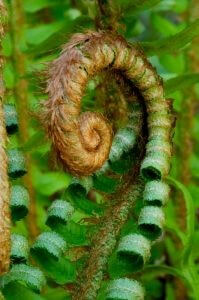 They don’t usually unfurl the new fronds till March/April. Leaving the old foliage helps protect the soil and provides habitat for beneficial insects and rare critters like our NW salamanders. So, if you can stand to wait until late Winter to cut them back, you will benefit from from the old vegetation over winter. Just don’t wait too long. If the new fronds have emerged it will be a tedious task snipping out the old fronds without damaging the fresh ones.